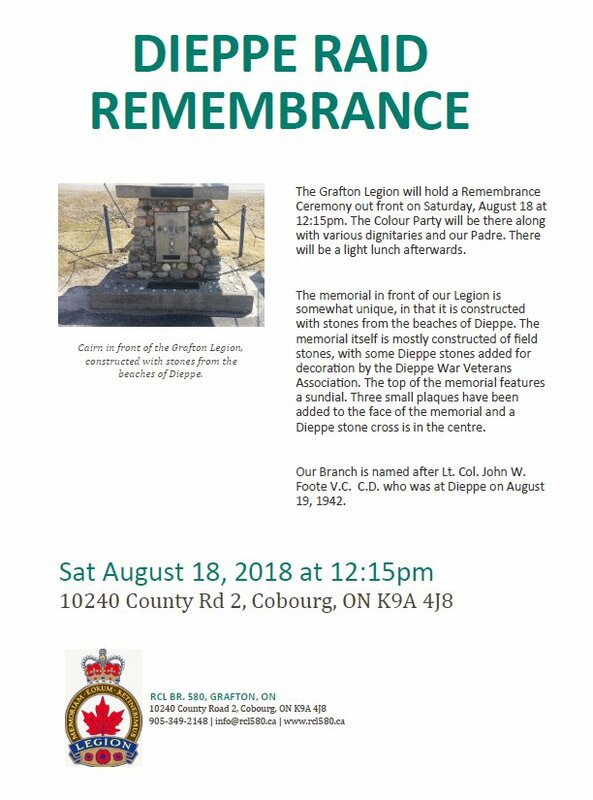 The Grafton Legion will hold a Remembrance Ceremony out front on Saturday, August 18, 2018 at 12:15pm. The Colour Party will be there along with various dignitaries and our Padre. There will be a light lunch afterwards. The memorial in front of our Legion is somewhat unique, in that it is constructed with stones from the beaches of Dieppe. The memorial itself is mostly constructed of field stones, with some Dieppe stones added for decoration by the Dieppe War Veterans Association. The top of the memorial features a sundial. Three small plaques have been added to the face of the memorial and a Dieppe stone cross is in the centre. Our Branch is named after Lt. Col. John W. Foote V.C. C.D. who was at Dieppe on August 19, 1942.